Plastic packaging produces more injuries than knives. Cuts, blood in your fingers, broken teeth lead to madness and frustration when you are dealing with one of those "impossible to open" platic sealed packages. The idea behind the stubborn plastic packages is to make stealing a lot harder, it turns out they make stealing impossible unless you steal the whole package but it makes opening for the legitimate owner the same impossible task. 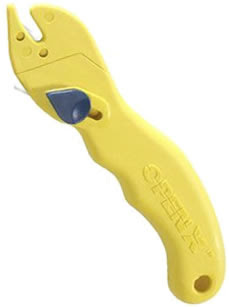 The open-x is a tool specifically designed to open such packages it has a retractable piercing blade that you use to perforate the plastic and make a small incission (about 1 inch) once you have that incission made you insert the tip of the tool and slide through the plastic cutting it open. The dual-blade design works great and is safe to have around when opening boxes or packages without risk of getting hurt. Can you do the same with other tools? Probably but the sliding blade is really the ad-hoc tool for opening the plastic packages so if you do that a lot this tool will help you reduce damage to your person and your mental health. You can read more information at the official website or order for about $5 from Amazon. 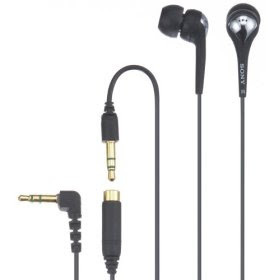 This earbud-style headphones from Sony are a good quality for the price, they have excellent bass sound and very good noise cancelation, the plastic buds are confortable to wear inside your ears. They come with a carrying case and a cord extension, the cord without the extension is good for arm or neck carried MP3 players but will probably be short for your pockets or a backpack, with the extension the length will be fine but maybe a little excesive. Does this mean the cord is always either too short or too long? Probably yes but it all depends on how you carry your gadgets. For an Ipod and comparing to Apple headphones this ones have better sound, extremely good bass and they don't have the "ipod owner please mug me" label on them. The cord is probably not as strong as the cord in Apple's headphones so some care will probably be needed. The cord did not break or shown signs of wear in our tests but it looks more delicate than Apple's. You can get them from Amazon for $30. This illumination kit consists of a Luxeon 1 watt flashlight and several accesories to use the flashlight in different configurations. The flashlight itself uses either a 1xC123 lithium battery or 2AA batteries, so the first accesory is precisely a 2AA body for the flashlight. The light has a 20 lumen output and is certainly not very bright compared to other luxeon lights in the market, the runtime is about 2.5 hours using either the 1x123 or 2xAA body. 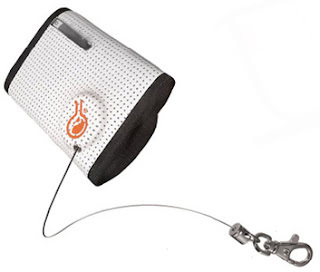 The next accesory is a lantern, the flashlight can be screwed into the lantern and then used as a task light, night stand or camp light the lantern accesory features a dome and a reflector to diffuse the light in all directions, it works very well. The next accesory is a tripod that is just a standard mini tripod that can be used to attach the lantern accesory, it has 3 collapsable legs and a ball joint head to point the lantern in the direction you want. Any standard camera mini tripod will work and a standard full sized tripod can be used as well. The next accesory is a headlamp that has the headband and a carrier for 2 AA batteries, the head ot the flashlight can be screwed to the carrier in the front of the headlamp it will be probably a little bulky for the amount of light it produces. Without doubts the lantern accesory is the best of this kit, the flashlight is dim and the runtime is not very great for a camp light or lantern, the headlamp is too bulky and the runtime and brightness is also not very attractive for a headlamp. It's a pitty the accesories are not sold independantly because without further discussion we would recommend the lantern and disregard all the rest. 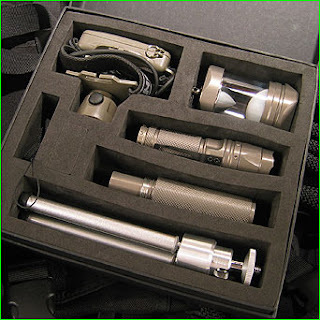 No doubt you can get a better lantern, better headlamp and better flashlight buying different sepparate products what makes the kit interesting is the ability to have everything sharing the same LED bezel. Unfortunately the bezel is not bright enough, the headlamp is not good and the tripod is not needed since any regular tripod will be useful. Great idea but not the right execution. You can read more about this kit in Phoebus website or order for $89 from TAD Gear. Chains are very versatile tools for EDC, you can use a chain for carrying gadgets or items on your neck, you can use it to secure your wallet to your belt loop, you can use small chunks of chain to create better belt loops, you can use it as a keychain or to carry items inside your pockets that you can retrieve easily without risk of losing them and many many other uses. 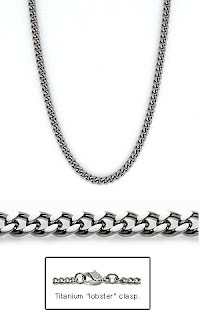 These chains from Titaniumstyle.com are made of pure grade 1 commercial titanium, they are available from sizes 6-09 (1.8 mm) to size 6-14 (6.9 mm). From $69 to $119 respectively. In the middle you have four intermediate sizes. They can be ordered in lengths of 16'', 18'' or 20'' larger sizes can be ordered at an extra cost. The chains feature a 100% titanium lobster clip and a small titanium ring at the other end where the lobster clip can be clipped to get the chain closed. The clips are quite small so they are probably not good to attach the chain to gadgets or a belt loop, they can be clipped to the chain itself to create a loop if you want. Countycomm's $3 titanium screw links are probably a good idea to complement the Titanium chain and have some 100% ti attachment points if you plan to use it for something else than neck carry. You can order this chains following this link. The Andorra rewind wallet is a urban/sports trifold wallet featuring a retractable steel cable with a clip. The trademarked rewind system consists of a slash resistant steel cable that unspools from its embedded spring-reel. It can then be clipped to a bag, belt loop or other attachment point for safety. The wallet is made from perforated water-shedding leather and is available in white, brown, blue or pink. It has 3 card slots that can hold up to 9 cards, a change compartment and a non stick mesh ID window pocket (internal). Outside it has a quick check cash window that allows to verify cash availability without opening the wallet. The main closure is velcro and does make some noise. The total weight is 3.25oz (95gr). The rewind cable and clip system is very practical you can clip the wallet to your belt loop and it will be discrete yet very secure this can be a good insurance for people that like to carry the wallet in the back pocket and uses public transportation or visit crowded places often, with the steel cable clipped somewhere, getting the wallet stolen or lost is a lot harder. There is no outside pocket, zipper or window and the closure is velcro so you have to open the wallet every time you need to get some change or something from it considering that safety is a design feature of this wallet an external pocket would have been a good adition. You can get more information and order for $38 from Civilian Lab website.